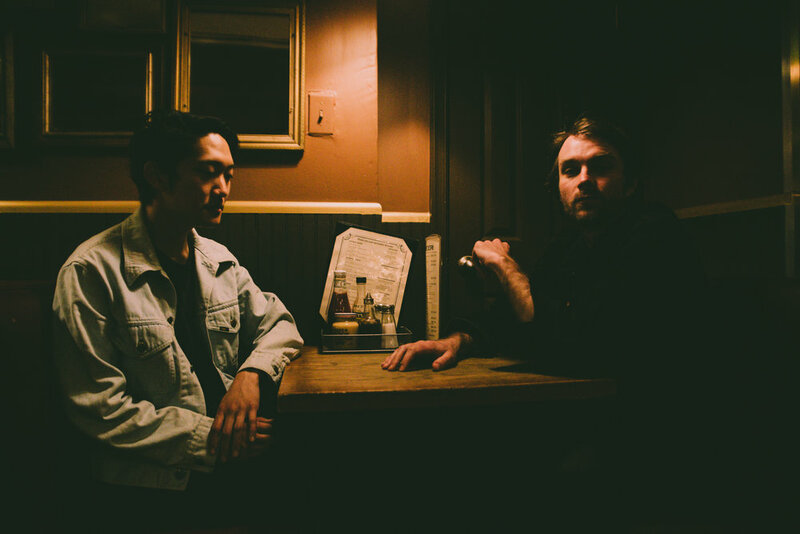 Handsome Ghost is an acoustic, pop-synth duo (Timothy Noyes and Eddie Byun) that recently dropped their first album, Welcome Back. The record uses intimate sounds and sincere lyrics as means to honor a past love and embrace a hopeful, new beginning. We caught up with Tim and Eddie during their stop in Washington, D.C. Be sure to check out their album, Welcome Back, and drop in on their future tour dates here. You wrote 180 songs for this album. Timothy Noyes: I think it was around 100, to be honest. We had around 100, not necessarily for the album, but around 100 to choose from. Some of the songs span from a couple of years. Eddie Byun: Some of the songs were written originally for the Steps era. Then we pulled them out and re-did them. What’s the process of deciding on a single theme where you’re like, “Okay, this is the direction I want to take it.” What’s the process of narrowing down those songs? How did you decide you wanted to put a nostalgic theme on your album? EB: I think it happened naturally. I just chose the songs that really struck me and compared the list of songs that [Tim] wanted on there and then it all came together with similar themes. TN: Yeah, it was almost the reverse. It wasn’t necessarily, “This is the theme we’re shooting for," but we just gravitated towards songs that fit. We picked our favorites and as we were going through them we were like, “okay, this is what the album is about.” At least lyrically. EB: So, we didn’t necessarily choose the theme. It’s kind of hard to be vulnerable with or talk to your friends about certain things, so what is your reaction, Eddie? Where Tim is like, “Here are my lyrics. I’m kind of brokenhearted.” How do you feel when you hear this? EB: We talk about the lyrics themselves very little. In my head, I come up with my own meanings for them, which I think is important because that’s how most people do it. That’s why Tim doesn’t specifically go out and say this is a song about this, this, and this. Actually, there are certain songs that I find out what they’re about through interviews. TN: I appreciate that because it can be kind of uncomfortable to talk about. It’s a super personal thing so you don’t necessarily want to get a lot of questions about it from your friends. EB: And we’re best friends. TN: Yeah, you can probably figure it out. But you’re not necessarily going to be like, “Hey, what is that song about?” I do appreciate that if I write a song that isn’t up to the lyrical standards like if I just write a dumb song, you’ll find a way of telling me. EB: Sometimes I’m almost positive I know the meaning. Like Reckless Lover, I was almost positive I knew what it meant and I was completely wrong. For "Reckless Lover", it’s kind of about this crazy love, where you’re trying to balance logic, but want that passion. What do you think love is? I always grapple with this dichotomy of love is this initial passion, excitement or is it that comfort level and friendship and long-lasting transformation with each other. Is that love? What do you think? TN: Oh, I feel like I could give a lecture on this. That’s a really good question. EB: Do you want to dive into your lecture? TN: [Laughs] I’ll keep it brief. I think it’s probably different for everyone and I think it’s really, really hard to articulate, but I would say it’s probably a combination of the two things that you mentioned. I would imagine, hopefully, passion and comfort. It’s just something that you know. You just know it when you feel it. That’s one of the questions of the world. EB: I feel like I run into a lot of problems trying to define love throughout my life because it’s easy to kind of let whatever situation you’re in dictate that. I think that can be a dangerous thing. It can also be fun. I think, now, I’m at a place where it’s just defined, on my own, by the other person’s happiness. If we both are happy then we can call that love. TN: That makes sense. I think recognizing too, that every relationship, whether it’s romantic or not, is different. Personally, I’m working not comparing everything to one person. Everything, like everyone, is its own thing. In "Better Off", I hang on the “pause”, because then you say, “We’re better off.” People often say that because they’re with their friends and to reify that they’re really are better off, but are they actually better off? You wrote an album about one person to move on, do you actually feel like you’re better off? When do people say that do they mean it? At what point do you continue fighting for it? TN: I think the “pause” line is meant to do just that. Maybe you want everyone to think that you’re better off, but I think it’s also a common desire. I think more than anything, it’s just about celebrating what was originally a really good thing. Even if it doesn’t work out, if you spend years with someone, that’s important. That’s something that should be cherished and celebrated. Even if it fell apart at the end. That doesn’t make it a bad thing. I think it’s more about honoring that time. EB: As a fan of the lyrics, the thing that I like most, and I think that you caught that, is that these songs can mean vastly different things depending on what my mood is. So, if you feel like you’re at that point in a relationship then it’s a very uplifting song, but if you’re trying to get over one, you feel like you can still relate, but it’s heartbreaking. That’s what I love about the songs. They play with your different experiences. TN: When I was first learning to love music, I was a fan of a bunch of different bands. My favorite songs were the ones that don’t tell you how to feel. You can draw some of your own conclusions and make your own connections. That’s the stuff that I’ve always liked, so it just came naturally. I meant something when I was writing it, but it’s up to the listener to decide how to feel. That’s one thing I like about your music; it’s not angry music. There are a lot of breakup songs that are like, “F- you”, “you’re this or that”, but did you write any songs that were angry? TN: I don’t have any “F- you” songs. I don’t think so. I think for Welcome Back, it was about one specific relationship. It was not a bad relationship. There were angry moments, but for the most part really, really good. I think it’s more about making sense of the ups and downs, what went great, what went wrong. To be honest, I messed up a lot. I feel like if there was going to be anger it would probably come from the other person. Is there anything that you want to say? Doesn’t even have to be about the album. Anything that you feel like you need to share? TN: We’re still celebrating the album. It’s less than a month old, but we’re trying to work towards the future as well. We’re releasing an acoustic EP, shortly. Songs from the record, just reimagined. We have a headline tour that we’re looking forward to following this tour. We’re busy and it feels good. EB: Going into the studio and making some new sounds. TN: We have a studio, at our house where we both live. A lot of Ed and Tim time. We can also just get back to work whenever we want to since we don’t have to book studio time. CONCERT GALLERY: Brockhampton at Rock & Roll Hotel in Washington D.C.